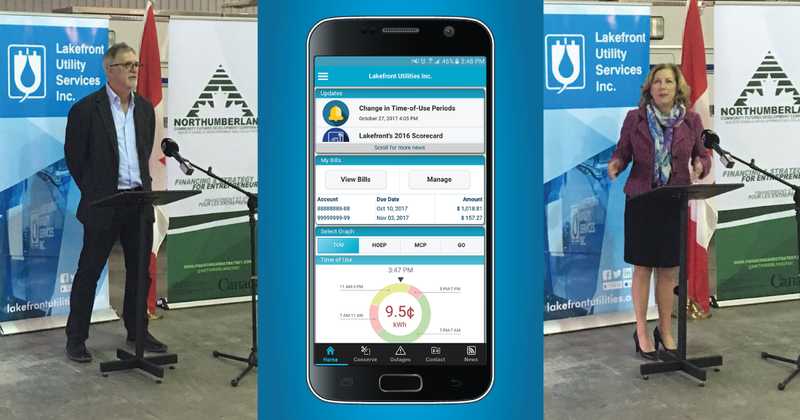 Lakefront Utility Services Inc. announced the official release of their Mobile Application during a launch event held at Lakefront’s Garage on 25 Ewart Street, Cobourg. Lakefront was joined by Kim Rudd, Parliamentary Secretary to the Minister of Natural Resources and Member of Parliament for Northumberland−Peterborough South, Screaming Power Inc., Northumberland Community Futures Development Corporation (CFDC) and members of the Town of Cobourg Council to celebrate the launch of the first Mobile Utility Solution of its type in Ontario. The Mobile Application expands upon Lakefront’s current customer service programs by providing billing, consumption and conservation information, as well as instant outage notifications and pertinent news all from the convenience of their customers’ mobile device. Through mobile innovation and technology, the utility has empowered their customers to better understand and manage their water and electric usage by providing them with this automated and user friendly mobile solution. President, Lakefront Utility Services Inc.
Customers are encouraged to download the App for free on Android and iOS devices by searching Lakefront Utilities at the Google Play Store or the App Store. This mobile application has been made possible through the assistance of Screaming Power, Cornerstone Hydro Electric Concepts, the Federal Economic Development Agency for Southern Ontario’s Eastern Ontario Development Programs Collaborative Economic Development Projects (CEDP stream) delivered by Northumberland CFDC and the Ontario Centres of Excellence. LUSI provides the human resources, administrative, financial and operational services to The Town of Cobourg Holdings Inc. and the utility subsidiaries, safely and efficiently, in compliance with applicable regulations. LUSI provides customer-focused and cost-effective multi-utility services so that customers benefit from service advantages and economies of scope cost savings. LUSI also operates the Water Systems for the Town of Cobourg, Township of Cramahe (Colborne) and the Hamlet of Grafton. CHEC is a not for profit association that is committed to its members, assisting them to service their customers and communities. They are premier LDC Cooperative in the Province of Ontario and look to exceed their members’ expectations through the sharing of services, opportunities, knowledge and resources. The intent of CEDP is to help trigger investment decisions that will strengthen innovation across Eastern Ontario and kick start new economic activity. CEDP can unlock the will and determination of Eastern Ontario’s industrial leadership to invest in emerging technologies, productivity enhancements, globally competitive business practices, new product development and skilled workforce development on a pathway to business growth, expansion and profitability.